Here you see my 3"x5" index card representing Italy. cut from an old National Geographic Magazine. 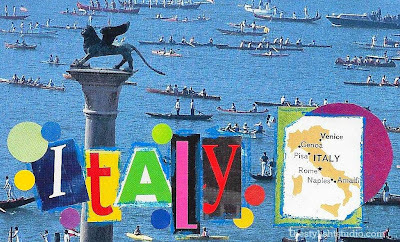 Random cut out letters spell 'Italy' and the letters are outlined in oil pastel. ~Cheryl Gee is decorating index cards and connecting the themes to music. The connection occurs during the time she meditates on the prompt. If you dig 1970s music, you'll think this slideshow is cool. Keep on truckin'!